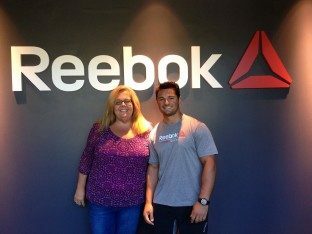 The benefits of exercise during the workday are proven by countless studies, and Reebok employees are living proof. In fact, at Reebok, a ‘corporate fitness’ mentality is more than accepted, it’s encouraged. It’s kind of crazy to say, but after working at Reebok for 30 years, I recently decided to make being fit and living a healthy lifestyle a priority in my life. So, as of late I’m one of those employees. It became clear to me that I was missing out on some of the most important benefits of working for a place where fitness is not a chore or a habit, but a passion. I was surrounded by people who ate, slept and breathed fitness, and it was time for me to take part. Plus, it didn’t hurt that I booked my first ever cruise to Bermuda this year! Who wouldn’t want to soak up the Caribbean sun while feeling happy and healthy!? Through taking steps to a healthier lifestyle, I’ve benefited not only physically, but have made new friends and become more active in the community. It’s truly been a positive change in every way! Find someone who motivates you! A little over a year ago, I was working out three days a week on one of the cardio machines upstairs. While it was a solid first step, trudging along on the elliptical was less than thrilling, and not particularly effective. Just as I began to lose motivation, I met the young gun who would help pave the way to my new fit lifestyle. John Caparrotta was a brand-new trainer here at Reebok and I often noticed him training women around my age. I figured, why not? I should give this a try! He was nice enough to offer his help, and we began cardio and resistance training in one-hour sessions, three times a week. It didn’t take long before I was feeling and looking better. While he does yell at me sometimes, it only motivates me more, and believe me, I yell back! It’s all out of love…! John’s help is just what I need to pump myself up and to clear my head for the rest of the work day. After my workouts, I feel refreshed and able to take on the second half of the day with more energy, vigor and passion. 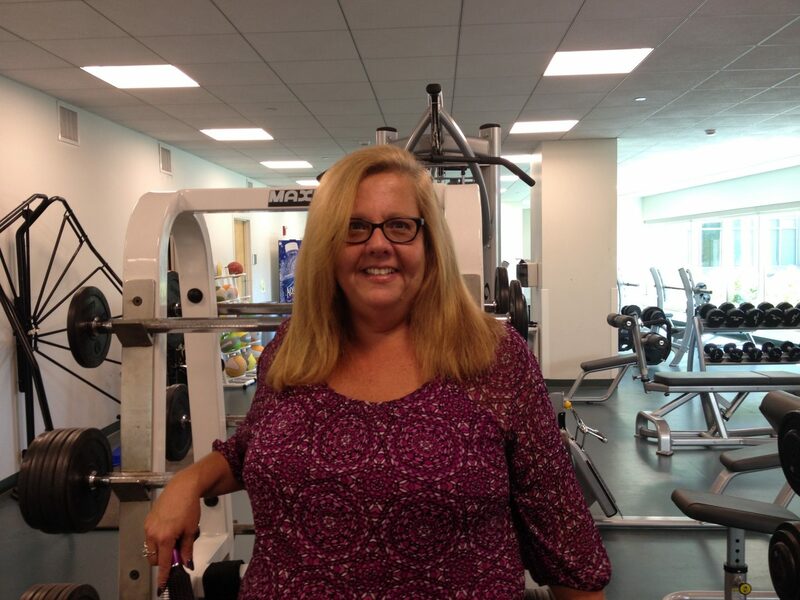 I have learned that the fitness center has so much to offer. There are several fitness classes provided including Les Mills, Barreless Barre, Muscle Conditioning, and Spin. I would have laughed if you told me this a few years ago, but since getting in the fitness groove with John, I recently began practicing yoga. It is a great addition to my workout schedule. I can honestly say that I feel my best after that class, even the next day. Beyond the physical benefits of the gym, I have met and befriended a new group of people. Everyone is very supportive and gives kind words or helpful hints on workouts. It is incredibly encouraging to have people cheering me along on my journey. 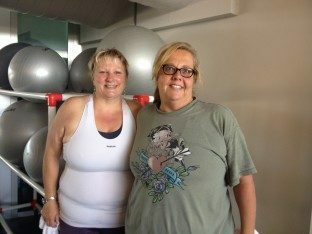 I have made a great friend and workout partner, Jackie Lamoureux. She and I train together with John once a week, do yoga one day, and this still sounds funny for me to say, but we jog at least once a week. Jackie is wonderful to have by my side. We have different strengths, so we push each other where and when it’s needed. I would encourage everyone to work out with a partner. My new friends and I have also had the opportunity to volunteer in the community. We went to the Franklin Park Zoo, cleaned cages and got to spend some quality time with the animals. I had a blast and am signed up to do it again next month! I’ve found a supportive community here and it feels great to give back. It really has been a great year, and I encourage anyone that is hesitant to get into a routine to just start, and stick with it… I swear I do my best workouts when I don’t feel like going and I’m grumbling all the way into the locker room. The more I do, the better, I feel – and the more I want to continue this new, fit lifestyle! I went on my cruise at the end of July and had a phenomenal time. It felt good to be on the go all day and not be tired or get winded. I did a lot of walking, swam with the dolphins, and maybe even a little bit of pulling the handle on the slot machine…all while feeling fit and having fun. Congrats, Kel!!! Though you grumble by my desk each day on your way down to the gym, you come back with a "Woo Hoo! He killed me!" each time! Keep it up! Awesome Job Kellie! So Happy For You =) Keep Up The Great Work & Keep Me Updated! Love hearing all about your workouts each week. "You Go Girl"
Which characters are help to become better in a team. Everyone who are working within a team or group must follow these tips to improve the work quaility. You also wrote the real value of Partnerships which so many businessman don't have good knowledge about it.